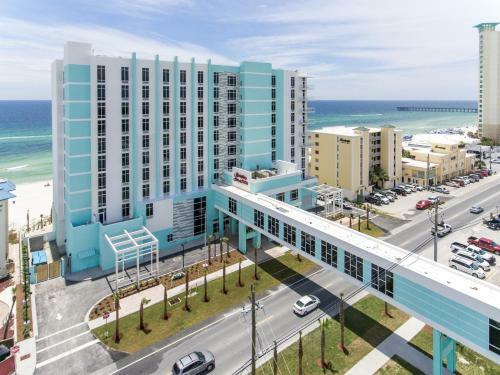 With a stay at Hampton Inn & Suites Panama City Beach-Beachfront in Panama City Beach, you'll be on the beach, just a 1-minute walk from Gulf World Marine Park and 11 minutes by foot from Russell-Fields Pier. This beach hotel is 1 mi (1.6 km) from Pier Park and 1 mi (1.6 km) from Hidden Lagoon Golf and Racetrack. Make yourself at home in one of the 182 guestrooms featuring refrigerators and microwaves. Complimentary wireless Internet access keeps you connected, and 42-inch LCD televisions are provided for your entertainment. Bathrooms with shower/tub combinations are provided. Conveniences include desks and sofa beds. Don't miss out on the many recreational opportunities, including an outdoor pool, a spa tub, and a fitness center. Wrap up your day with a drink at the bar/lounge. A complimentary hot/cold buffet breakfast is served daily. Featured amenities include a business center, laundry facilities, and ATM/banking services. Free self parking is available onsite.